The world of ATA RAID is a small one. When I first became interested there were two players: Promise and Highpoint. Slowly I began to hear of 3ware, a company that produced great products, but at a high price. At that time RAID 0 and 1 were about it, and then Promise released the SuperTrak100 and Adaptec released the AAA-UDMA, both touting RAID 5. At that time 3ware released a BIOS and driver update for their Escalade 6000 series that added RAID 5. Of course there was no onboard RAM cache, so performance was lackluster. Then with the second wave of ATA RAID 5 3ware released the Escalade 7000 series and things looked up. We’re looking at the Escalade 7500-8, an ATA RAID controller capable of handling 8 drives in RAID 0,1,5,10 and JBOD ( just a bunch of disks ) in a Windows 2000 environment. Opening the box revealed: the card, eight 18” ATA 80 wire 40 pin cables, a manual, a driver revision printout, a software envelope containing driver disks and a CD, and four molex “Y” power splitters. I read through the manual to get a feel for the product: it’s a thin photocopy that covers the basics. The manual covers the Escalade 6000 and 7000 series, so the photos in the manual are of 6000 series cards. What I found odd was that the 7.4 driver revision notes were thicker than the manual. Even so, the manual was straight forward and easy going for anyone with RAID experience. Looking at the actual Escalade 7500-8 adapter, it’s layout is simple and effective. 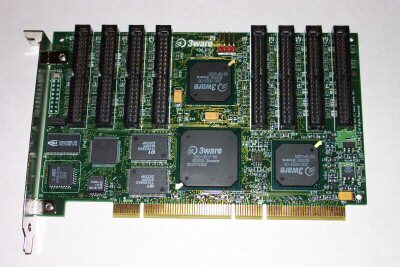 A central 3ware 200-0017-00 chip for RAID calculations and their own StorSwitch technology, two 3ware 200-0033-00 chips to each handle four ATA133 ports. Unfortunately there’s no information regarding individual ASICs on the 3ware website. Two 150 MHz 0.9 MB IDT memory chips for a total of 1.8 MB onboard cache, although I’ve read it online as 2 MB cache available. A few other chips on the board I was unable to identify, plus a four pin LED connector. The board is compact, reasonably short and well laid out. Installation was straight forward: connected the drives, inserted the card and booted. the Escalade series are 64 bit 33 MHz PCI adapters, allowing for a maximum of 266 MB/sec transfers. Installed the drivers, rebooted and installed 3DM, 3ware Disk Management Utility for Windows. Creating, deleting and repairing RAID arrays is done via the card’s BIOS at boot up, and employs a simple and easy to understand interface. Creating RAID 0, 1 and 10 arrays was immediate: creating RAID 5 arrays took some time as X’s are written to test. This is good feature but takes some time. While it was inconvenient for testing and benchmarking, users should see this as a nice safety feature. As with all RAID products, the Escalade 7500-8 showed as a SCSI controller in Device Manager, and arrays show under disk drives. Monitoring and reporting is handled via 3DM. This runs as a web server, so access is through your browser and accessed locally or over your network. Again, easy to use and straight forward. Linux users have the CLI, or 3ware Command Line Interface. In the box I received driver version 7.4, which I installed and began to benchmark with. After a few weeks the board stopped working, so I took advantage of 3ware’s technical support. The system hung at the Escalade 7500-8’s BIOS and wouldn’t go any further. First you register your product online and create a profile, then submit a problem report. Within a day I received an RMA for the board, and since I selected cross shipment by providing my credit card, I received a replacement board within a week. Very nice and smooth technical support. This time the box contained the 7.53 drivers. I began benchmarking with these, the latest drivers. Performance was ho hum and nothing special. Following Storage Review’s forums on 3ware products revealed users resorting to registry hacks and changing disks from basic to dynamic to get better performance. Then a posting revealed a new driver revision, 7.6, that gave a real performance boost without the “voodoo” tweaking. Redid all benchmarks with the 7.6 driver, firmware and 3DM releases. Doing this revealed the product forces you to update all three items, another nice feature to keep things as 3ware wants it. Benchmarks don’t lie: the 3ware Escalade 7500-8 with the 7.6 drivers dominated all tests save WinBench99 RAID 5. Sometimes it’s a close call with the FastTrak SX4000, other times a huge margin. Recommendations are easy: 3ware products give the best ATA RAID performance. If you need to use 8 or 12 drives, they’re the only player in town. The Escalade 7500-4LP is a four drive low profile adapter and fits just about anywhere, another great plus. The only concern is cost: expect to pay 50-100% more for 3ware cards compared to Promise’s FastTrak SX4000. In this case you get what you pay for: the best performance for the highest price. Editors note: this review was migrated from the old eBabble.net site and the photos updated. Originally published May 30th 2003.